The Kaymac Immobiliser is designed to prevent theft and un-authorised use of your earthmoving machine. Many machines are left unattended and unprotected on the roadside, building site, forest and other remote areas leaving them vulnerable. Installing a Kaymac Immobiliser ensures your machine is secure in the best way possible. 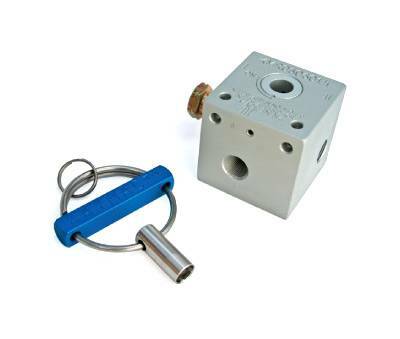 The Kaymac Immobiliser is a simple valve that is installed between the oil tank and the pilot hydraulics. Once activated by turning the unique key, oil flow is diverted back to the tank disabling the main hydraulic functions of the machine, transmission, tracks, boom actions etc. The Kaymac is totally hydraulic and not affected by power shortages, vibrations, moisture, dust or dirt. It stops the machine from being moved preventing theft, joy riding, or removal of expensive attachments. The device carries an International Patent (pending) and is unique and unlike any other device available today. For pricing or more information about the Kaymac Hydraulic Immobiliser fill out the form and we&apos;ll be in touch soon. Alternatively call (08) 9457 1544.